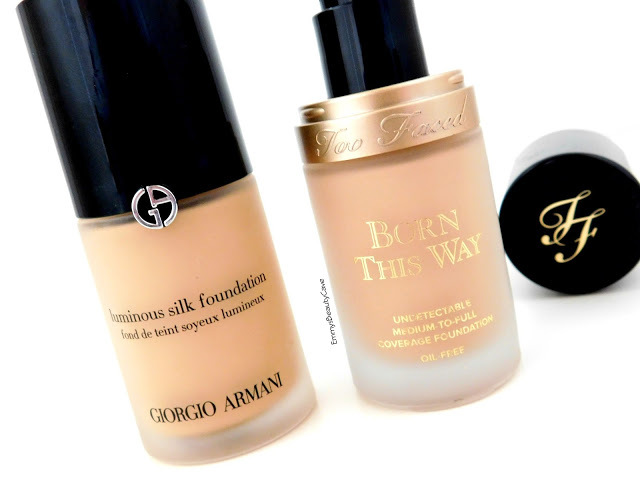 Since doing my High End Foundation Collection Post, I have had quite alot of people ask me if you need both the Giorgio Armani Luminous Silk Foundation and the Too Faced Born This Way Foundation. I honestly don't think you need to own both because of how similar they really are. I wanted to do a full comparison on them including coverage, longevity, formula and more. Not only is the packaging similar but they have alot of similarities and out of the two I do have a favourite. Giorgio Armani - Claims to be light to medium coverage, I find it is definitely medium coverage over light. You can still slightly see my freckles through it. Too Faced - Claims to be medium to full coverage but I find I can only get medium coverage from it no matter how much I build it up. Even when built up you can still see my freckles slightly. Neither can be built up to full coverage, they are both medium lightweight coverage. Giorgio Armani - Oil free, no SPF (most of the other Giorgio Armani Foundations they do have SPF, including the new Power Fabric Foundation but unfortunately the Luminous Silk doesn't seem to contain SPF). Too Faced - Oil Free, SPF 30. Both are liquid formula's that feel very lightweight on the skin. They both feel exactly the same when applied. Giorgio Armani - In the UK it seems we have 21 shades available but in the US there are 24 shades available. This amount of shades makes it perfect for all skin tones to find a match. Too Faced - Has 18 shades available which is still good as alot of brands struggle to find shades to work for pale skin tones and dark skin tones. Giorgio Armani - Even though this is called Luminous I don't think it is too glowy. It doesn't dry matte so for me I always have to set it with a powder. I have oily skin and sometimes combination and I find this foundations works well. To stop me getting oily I do have to use a mattifying primer and powder. This would suit dry skin as it doesn't cling to my dry patches at all. If you have oily or combination skin it will work for you as long as you use the right primers and powders. Too Faced - This isn't as luminous as the GA foundation but it doesn't dry down matte either. I find this one does last better on the oily parts of my skin. Again I always prime and set it with mattifying products. With both I sometimes just apply a mattifying powder to my most oily area's and then a normal powder everywhere else. You definitely don't need to own both of these because of how similar the finish and lasting power is. If you have extremely dry skin I would recommend the Giorgio Armani one as it has a more glowy base and doesn't cling to dry patches. Even if you have oily skin but want a luminous finish the Giorgio Armani Luminous Silk will work for you but remember to use mattifying products with it and bear in mind you will need to touch up at least once during the day. Personally I would re purchase the Too Faced Born This Way Foundation over the GA Foundation. I find it lasts a little longer on my skin. My skin type switches between oily and combination. I am always extremely oily on my chin and the outer corners of my nose then I sometimes get dry patches on my cheeks. I hope this post helps if you have been thinking about purchasing both of these as there is no point in buying both. Why not go and check out my High End Foundation Collection which includes 8 Foundations and see which ones I love most.